What where you like as a kid? Like any other kid who grew up in Brooklyn’s East New York in the mid-’20s. Do you think you career would have been possible if your parents had not been so encouraging? I think I would have continued to draw if my parents didn’t encourage me. But I’m sure glad they did. What was it like to get your first job in comics making $5.00 a page when you were so young? Your parents must have been very proud? I was 13 or so when I sold my first work. The money was less of a thrill than the fact my drawings were going to be published. Yes, my parents were very proud. What was it like to grow up in Brooklyn in those days? Drawing probably saved my life, because it kept me out of trouble. Were you always a fan of comics yourself? I always loved cartooning from the time I saw my first comic strip in the newspapers (before there were any comic books). And I loved comic books, and I still do. As this is a magazine that caters to horror/sci fi/dark fiction, are you a fan of any of that? I enjoy all genres, but horror and dark fiction are my favorites. Were you a fan of the original horror monsters of film? I remember Dracula, Frankenstein and King Kong as a kid (1939). They scared the hell out of me and I loved them. What is the earliest scary memory you can recall? 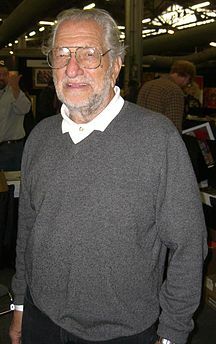 You formed the Kubert School of Art with your wife Muriel in 1976. What led you to do that? I thought it was a good idea, so long as it didn’t impinge on my own work and career, and my wife, Muriel, was willing to run the business end of the business. Do you feel it is a blessing to be able to pass what you have learned onto the artists of tomorrow? I don’t think in those terms. The blessing is that I’m able to get up, sit at a drawing table and draw (which I love), and people pay me for it. Andy and Adam are also artists. What was it like to see them follow in your footsteps? I thought it was a miracle. I still do. I think comics are a form of dark fiction. Why do you think the struggle between good vs. evil has always made such interesting comic tales? I think the struggle between good and evil is the basis for 95% of all literature. I revisit many subjects, hoping to bring new perspectives. What is the best advice anyone has ever given you? Who was it? Harry A Chesler. “Keep at it, kid,” he told me. What projects are you looking forward to bringing your fans next? Several. Too soon to speak about them. Just to thank them for their interest.